The municipality of Beauvechain (in Dutch, Bevekom; 6,596 inhabitants on 1 January 2007; 3,858 ha) is located 8 km north-east of Wavre, on the linguistic border between French and Dutch. The municipality of Beauvechain is made since 1976 of the former municipalities of Beauvechain (1,263 ha), Hamme-Mille (824 ha), L'Ecluse (Sluizen; 380 ha), Nodebais (538 ha) and Tourinnes-la-Grosse (Deurne; 854 ha). The territory of Beauvechain was already settled in the Neolithic, as proved by hewed flints found on a sandy mound in Hamme-Mille and tombs found near the Saint-Nicaise forest. In the Roman times, it was crossed by the Boulogne-Cologne way. The first organized village of Beauvechain dates back to the Frankish times. St. Ermelinde (d. 600) is said to have lived in Beauvechain, which is named after St. Bavo (as "bavoheim", Bavo's estate). The villages were sacked at the end of the IXth century by Northmen coming from a camp near Leuven. At the end of the Xth century, Countess Alpayde ceded the villages to Notger, Prince-Bishop of Liège. In 1013, the battle of Hoegaarden opposed the Count of Leuven to the Prince-Bishop of Liège. Accordingly, Hamme, L'Ecluse, Mille and Nodebais were incorporated to the County of Leuven, whereas Beauvechain and Tourinnes remained to Liège, forming enclaves within the Duchy of Brabant for the next seven centuries. Around 1230, Duke of Brabant Henri II founded in Hamme the Cistercian womens' abbey of Val-Duc, ran by the abbey of Villers; the abbey was burned in 1667 and sacked several times during the next years, as were the villages (Beauvechain in 1693, Hamme in 1707). Mille was incorporated to Hamme by an Imperial Decree in 1811; Beauvechin and Tourinnes were separated by a Law in 1841. In the middle of the XIXth century, several villagers emigrated to Wisconsin (USA), where there is still a significant Walloon-speaking community. The Air Force Base Lieutenant Colonel Aviateur Charles Roman of Beauvechain, founded in 1936, houses the 1st Wing, made of the 5th (flying on Marchetti SF-260) and 7th (flying in the last four Fouga Magister still used in the world) Flight Squadrons. It is mostly used as a training center for the pilots. The base of Beauvechain also houses the Wing Meteo and the Air Force Band. It employs 1,100, being therefore the second employer of Walloon Brabant. The airfields of Les Burettes and Le Culot were set up in 1936 by the Air Force. On 10 May 1940, the German Luftwaffe attacked the two airfields and destroyed several Hurricane and Gladiator aircrafts. The Germans revamped Le Culot, which was bombed by the Allied air forces in January 1944. The US Air Force settled in the airfield from October 1944 to June 1945. After the liberation, the Spitfire flying squadrons created inside the RAF were relocated to Beauvechain, where they formed on 1 February 1948 the 1st Fighters Wing, including four squadrons. The first F-16 arrived in Beauvechain in January 1979. The 1st Fighters Wing was disbanded on 4 March 1996 and its squadrons were relocated in Florennes and Kleine Brogel. The 1st Wing was formed with two squadrons relocated from Gossoncourt and Brustem. The municipal flag of Beauvechain is yellow with two red stakes placed horizontally and reaching the second third of the flag width. Jaune palissé longitudinalement de deux pièces rouges se terminant au deuxième tiers du battant. The flag is made of the dexter part of the municipal arms. D'or palissé en fasce de deux pièces de gueules, senestré de sable à une crosse abbatiale d'or, le crosseron tourné à senestre (Or urdy two pieces gules the sinister side sable an abbot's crozier or). 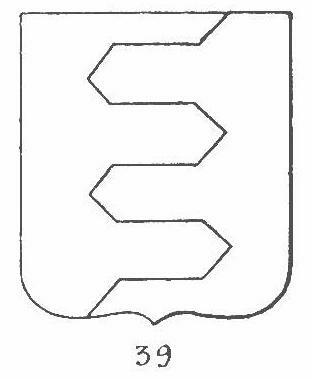 François Velde's glossary shows this partition of the shield as palissadé and not palissé, which is translated as "urdy" or "palissado". The partition recalls that Beauvechain is made of five former municipalities, two from the Principality of Liège and the two other ones from the County of Leuven (represented by the colours yellow and red, respectively, I presume). The partition also recalls the letter B. The crozier recalls both the Bishop of Liège and the abbey of Val-Duc in Hamme-Mille.